Bills LB Brandon Spikes hasn’t seen a lot of playing time on defense, due in part to the stellar play of Preston and Zach Brown at the inside linebacker positions. But head coach Rex Ryan and his defensive staff have been trying to find ways to get him on the field here and there. Knowing that if they want to have Lorenzo Alexander available to them for all 16 games in light of his eye-opening production on defense (4 sacks in first 4 games) they can’t play him 70-80 plays a game (he also plays on special teams), they’ve used Lerentee McCray as a rotational OLB for both Alexander and Jerry Hughes. On obvious run downs, they’ve also sprinkled Spikes in at OLB to help set the edge in the run front. Spikes is a bit stouter than Alexander at the point of attack, and played up on the line a good deal back in his college days at Florida so it’s not a foreign role for him. Ryan knows Spikes is respected leader in the locker room, so he’s trying to find ways to get him involved in the game plan week to week. His first week with the Bills at training camp, Brandon Spikes was falling all over himself thanks to a full calendar year away from the game. The veteran linebacker was on his couch in 2015, unable to latch on with a club. Now three weeks in with Buffalo, Spikes feels his game rounding back into form. Spikes’ greatest asset is his ability to diagnose run versus pass. He had a couple of plays where he made tackles in the run front before offensive linemen could even set their blocks. Spikes still brings the wood when he hits ball carriers as well, but right now he’s hoping to finish the preseason strong so he can lock down one of the team’s 53 roster spots. Less than a month after signing a free agent contract with the club that made him a second round pick in 2010, Brandon Spikes is again a free agent. That according to ESPN’s Adam Schefter, who is reporting that the New England Patriots have released the veteran linebacker. Patriots released LB Brandon Spikes, per source. Wasted no time…. ESPN is reporting there was an incident early Sunday morning involving Spikes and an abandoned car that is being characterized as a hit and run accident. Spikes played for Buffalo in the 2014 season on a one-year contract. 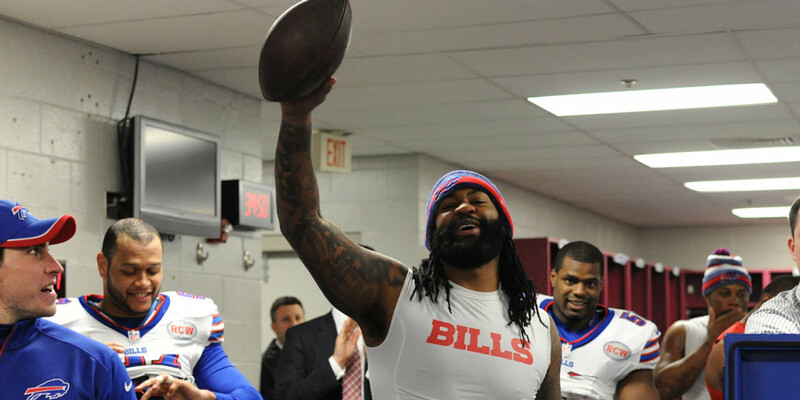 Bills free agent LB Brandon Spikes has chosen to sign with the team that drafted him. According to ESPN Patriots reporter Field Yates, Spikes has signed a one-year deal with New England. From @AdamSchefter & me: the Patriots have signed free agent LB Brandon Spikes to a 1-year deal. Spikes spent the 2014 season Buffalo. Spikes made a free agent visit with the Patriots last week. Buffalo was interested in bringing Spikes back at the right price, but GM Doug Whaley made it clear it would not be as a starter. Spikes is not likely to be a starter in New England either, but with the two starters in front of him coming off of injuries (Jerod Mayo – patellar tendon, Dont’a Hightower – labrum) Spikes stands a better chance of being on the field in New England. Spikes was a second-round pick of the Patriots back in 2010. Bills free agent LB Brandon Spikes was an in studio guest on NFL Network’s NFL AM show Wednesday. Spikes was asked about the likelihood of him re-signing with Buffalo. When asked if he’d like to be back in Buffalo for 2015, Spikes answered in the affirmative. Though Spikes only spent one season in Buffalo he has an affinity for the city and the fans who embraced him. Spikes was also asked about Bills new head coach Rex Ryan and if he thinks he’s a match for the type of player he likes. Bills GM Doug Whaley said at the NFL Combine last month that they told Spikes he’d be welcome to return as a one or two down linebacker at most with a price fitting of such a player. He also encouraged him to see if he could do better on the open market knowing Spikes still wants to be a starter in the NFL. As for how he’s approaching free agency Spikes said he’s left it in the hands of his agent. When asked if he would return to New England, Spikes said he would play anywhere. Bills free agent LB Brandon Spikes would like to still be a three down linebacker in the NFL, but that is not a role he would have if he chooses to re-sign with Buffalo. Bills GM Doug Whaley, in an appearance on the John Murphy Show confirmed that he spoke with Spikes personally Thursday and laid out how they view Spikes as a player on their roster in Buffalo. With Kiko Alonso set to return healthy in 2015 combined with the emergence of Preston Brown and Nigel Bradham in 2014, it’s evident they don’t see Spikes as a full-time linebacker. “I just talked to him today and the new staff sees a different role than maybe he does so I told him to see if he can get a team that sees him the way he sees himself,” said Whaley. “If not, come back to us and then we can talk. Spikes will likely test the market and see if he can land a full-time starting job in free agency. If he can’t he’ll probably return to the Bills to where he said he really enjoyed the city and his teammates. He’s had a conference call with the Buffalo media twice a year for the last six years and there have always been a couple of players that new Bills head coach Rex Ryan will single out. Two in particular this past season were on the defensive side of the ball for Buffalo. Ryan was being asked about Buffalo’s defense in one of his conference calls this past season and he quickly mentioned two players specifically in his comment. Ryan has mentioned Kyle Williams almost every season he has been head coach of the Jets on his conference calls, so the new Bills head coach has to be pretty pumped that he now gets a chance to coach him. Brandon Spikes is set to become an unrestricted free agent. It will be interesting to see how the hiring of Ryan could impact Spikes decision making this offseason. Bills LB Brandon Spikes didn’t log the most snaps on defense at linebacker this season. He’s also a free agent come next March. But all Spikes could think about was how much fun he had with his teammates this year in Buffalo and how much he enjoyed playing in front of Bills fans. When asked what his future might hold concerning being back with the Bills, here was his response. Nigel Bradham’s big statistical day in Sunday’s win over the Browns earned him a spot on the Week 13 Pro Football Focus all-star team. Bradham, who led the team with 12 tackles, including one for loss, a sack, a QB hit and pass breakup, was named one of the two linebackers to the PFF all-star squad for this past week’s action. Here’s what they wrote. Two huge performances at linebacker this week, where Bradham and Lansanah combined to record 19 defensive stops. Opposing quarterbacks tried to beat them on short passes in coverage, but allowing seven and two receptions, respectively, they went for a total of just 36 yards between them. As seen above Brandon Spikes was also an honorable mention as he chipped in five tackles in the win. All offseason the Bills worked their tails off to be a better opponent for the perennial AFC East champs, the New England Patriots. Brandon Spikes was among the most vocal Bills determined to dethrone the Patriots. It simply didn’t happen on Sunday however, and not being able to back up his words is what left Spikes most disappointed. Spikes is hopeful that in the second meeting in the season finale they can even the score and position themselves where the game means something. It’s been a historic week for the Buffalo Bills franchise. Sunday should be electric! For now let’s get to your questions this week on email at AskChris@bills.nfl.net and on Twitter @ChrisBrownBills. Brandon Spikes only signed a one year deal in the off season, do you think the Bills will try and wrap him up long term? CB: Spikes was brought in for a reason, to improve the team’s run defense. I think the one-year contract is very indicative of the club’s approach. It appears to be a let’s see how it goes approach. So it’s my belief that the powers that be will see how Spikes’ season plays out, and come the offseason they’ll assess his value and potential contributions for the team’s future. I can say that in talking to Spikes he likes his teammates, coaches and the atmosphere here in Buffalo. He brings additional value with his veteran leadership, but I think it’s only fair for both sides to allow his full body of work to be reviewed before making any future decisions. The #1 weakness for Bills is the Offensive Line. Same story for the past 14 years. Right now, I have no faith in either Right Guard or Left Guard. Our O-line has been a disaster. I hope Richardson can play better than Chris Williams (who the Bills front office paid way too much for a below average guard). I think the Bills front office should have done a better job in free agency at the guard position. Not sure the Erik Pears experiment is going to work out. With Pears at guard he has not been effective pulling for screen plays, sweeps or trap plays. Question: I love Wood at center, but if the Bills guard troubles continue, perhaps the Bills could play Urbik at center and play Woods at guard again. Next year Bills need to Upgrade – O-Line, Tight End position and perhaps Quarterback if progress is not made this season. South Florida,…………. Thank you Terry and Kim Pegula!!!! CB: Concerning your question about Eric Wood, I think he is at his most valuable position at center. That’s not to say he couldn’t play guard, which he did early in his career with the Bills. It seems as though they’re interested in letting Cyril Richardson learn the ropes when Chris Williams’ back doesn’t allow him to play. That being said your idea isn’t a bad one. Kraig Urbik is the team’s backup center, so it is an option if the offensive staff feels it’s necessary to make a different kind of change at guard. I just think Wood is so valuable making the calls and performing in the pivot that I’d be hesitant to move him. My question is regarding the switch from Manuel to Orton. My understanding is that the Bills are under pressure to win now, EJ just isn’t where he needs to be and so Marrone needed to make the decision before the losses got out of hand. My question is, do you think that the plan they had going into the season regarding EJ and the offense is not working? I mean the O-line is really struggling which is making the run game struggle which forced EJ the past 2 games to throw over 40 times. I wonder if part of this move is not only about winning but it could also be about protecting EJ and his psyche. So now Orton will come in and fans seem to think that he can do a better job, but he also needs the same formula as EJ, a good O-line a strong run game and defense and I’m worried that the Bills have a bigger issue than just QB. I was just wondering your thoughts about that. CB: I think based on everything we’ve heard from coach Marrone on this subject that it was purely a performance decision. As coach Marrone said when he initially made the change at quarterback, he needs more production from that position. He was not getting enough positive plays from the quarterback position in the passing game and it was compromising their effectiveness on offense. We’ll see where things go with Kyle Orton now in the lineup, but this is a performance-based business and I believe that was the crux of coach Marrone’s decision. CB: Flooding the short passing lanes with defenders can help to disrupt some of the rhythm that Tom Brady relies upon in the Patriots’ passing game. How the Bills choose to do that remains to be seen. The general consensus by those outside the organization is to pressure Tom Brady, but that’s easier said than done even with a Buffalo defense that leads the league in sacks. Kansas City had an awful lot of success rushing four and dropping seven into coverage. They dropped linebackers and their box safety into zones and defended the middle of the field pretty well, which is where Brady likes to work with his tight ends and Julian Edelman. Buffalo could take a similar approach if they so choose. They have comparable personnel to the Chiefs up front and at the second level. In addition to your written work and videos on BB.com, I really enjoy your regular updates on the JMS. You are very frank and insightful on those calls and I look forward to them each week. My question relates to a subject I have not heard one person in the Buffalo print media nor BB.com family address since the announced QB switch – Kyle Orton’s motivation/determination. I have always thought Orton has all the necessary QB skills. Most importantly, he has the ability to read a defense and deliver the ball to the open receiver. I felt EJ was sadly lacking in both case aspects. However, I do not question EJ’s heart. He took a beating the last two weeks and seemed to courageously get back on his feet and put the last hit behind him every time. Do you think we can expect that with Orton? My biggest concern regarding his signing apparently “out of retirement” was the possibility he was just looking for a paycheck to hold a clipboard and mentor EJ. After nine years of bouncing around the league, does he have the personal motivation to lay it on the line for one more chance at football glory? I have not heard nor seen anything, other than the circumstances around his signing, to create that doubt, but I have not seen nor heard anything to suppress it, either. We will know soon enough, I suppose, once he gets under center. However, it would be great to hear from inside the Bills family that Orton is the committed to going into combat with his teammates. I truly believe the Bills have the skill players to make big plays on a consistent basis with a bunch of hungry young players surrounding a decent QB, and I hope the QB can mirror their intensity. CB: I appreciate the kind words. I think there is a measure of motivation for Kyle Orton with this current opportunity. In talking to him he admitted to me that this team is constructed in much the same way as the 2005 Chicago team he had to quarterback as a rookie after Rex Grossman was injured. Their defense was outstanding, they had good special teams and a strong rushing attack with Thomas Jones and Cedric Benson. Orton didn’t have to go out and win games there, and he may not have to do much of that here. The benefit for the Bills is he’s a much wiser quarterback and a much more seasoned leader now than he was then. I do believe the motivation could be at its highest this week, knowing his former head coach in Denver Josh McDaniels, is on the other sideline. McDaniels buckled to the pressure in Denver to start Tim Tebow, despite the fact that Orton led the Broncos to a 6-0 start. I don’t know this, but I wouldn’t be surprised if that coaching/organizational decision sticks in Orton’s craw perhaps more than any other. I don’t know that it does, and I’d never expect him to ever say that, but looking at all the decisions that went against him in his playing career, if I put myself in his shoes that one would sting the most for me.